Matt Drudge, of the Drudge Report, deleted all of his tweets except one this week, leaving visitors to his personal account with a single message about today's "manic digital age." Matt Drudge, of the Drudge Report, deleted all of his tweets except one this week, leaving visitors to his personal account (as opposed to the Drudge Siren™ Twitter account for the Report) with a single mystical message about today's "manic digital age." As The Blaze noticed, Drudge also changed his Twitter background to two parrots who appear to be grooming each other. 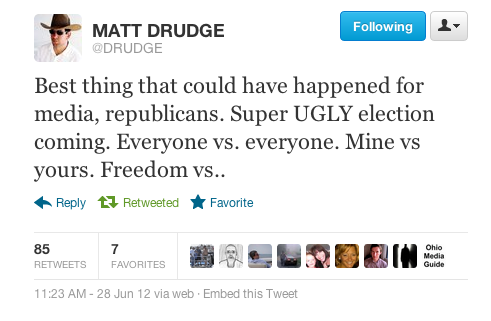 The single tweet that remains on his account fits with Drudge's history of being dramatic on Twitter. A history that is now, of course, erased. Aside from that tweet, Drudge hasn't commented on why he emptied his archives. We should note, however, that he has cleaned up his Twitter archive on at least one previous occasion. So maybe it was just time for a bit of spring cleaning. We already miss you. Please start tweeting again soon.